Philadelphia, PA – May 12, 2016 — Independent Computer Consulting Group (“ICCG”) is pleased to announce its strategic relationship with GapBridge Software Services (“GapBridge”). The partnership will extend market reach for each company’s offerings. ICCG is an Enterprise Software focused consulting firm with global presence and track record of more than 2,000 business transformation project executions across ERP, Supply Chain Planning and Execution Systems, Warehouse Management Solutions and Product Life Cycle Management Solutions deployments. GapBridge is a Digital Transformation consulting and services company, providing consulting services and solutions around digital transformation for enterprise customers. GapBridge offers solutions extensively on SAP Digital Stack – S/4 HANA, Cloud Solutions (Hybris. SuccessFactors, Ariba, HANA Cloud Platform), Mobile (SAP UI5, SMP) and Analytics. “GapBridge has established itself strongly as a true digital transformation company, enabling customers on various solutions from SAP on Digital stack. This partnership enables ICCG to take these capabilities and provide higher value addition to its existing customers. 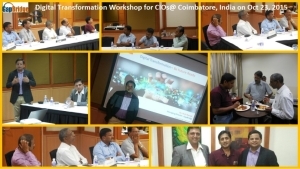 Digital transformation is very relevant for the clients ICCG has served for over two decades, especially as we focus our efforts to find new business within the fashion & apparel, retail and manufacturing industry verticals. This partnership is vital from ICCG’s perspective,” said Bala Anantharama, Sr. Vice President, ICCG. 2. Providing digital transformation solutions to customers. GapBridge will work closely with the ICCG team to offer solutions for its customers. The solutions will help ICCG’s customers achieve mobile enablement, IoT enablement, end consumer experience. GapBridge is a Global Enterprise Consulting and IT Services organization, providing solutions around Enterprise Applications, Mobility, Cloud and Analytics through On-Premise as well as On-Cloud. GapBridge operations are spread across Americas, Europe, Middle East and Asia supported through its Global Delivery Center (GDC) based in IT Capital of India – Bengaluru. Independent Computer Consulting Group (ICCG) is a Global Information Technology Solutions Provider for the Enterprise. Since 1988, ICCG has been providing innovative information technology solutions, always with an eye on the changing market and technological horizon. ICCG offers complete application and IT infrastructure services and support to meet key business needs and long-time global customers continue to rely on ICCG to satisfy their diverse and growing business needs. ICCG is dedicated to helping customers bridge their gap between ERP and SCM technologies and business problems to deliver greater value from their technology investments. ICCG’s functional and technology expertise spans Enterprise Resource Planning (ERP), Supply Chain Management (SCM), Warehouse Management Solutions (WMS) Product Life Cycle Management (PLM), Product Data Management (PDM), Business Intelligence (BI), Business Process Management, and Systems Integration and Migration. By specializing in five specific industries, ICCG has developed extraordinarily deep industry knowledge and are experts in mapping technology to your industry’s needs. Combine with a technology and application expertise, ICCG is uniquely qualified to accelerate the results. ICCG, Inc. is certified as a women’s business enterprise through the Women’s Business Enterprise National Council (WBENC), the nation’s largest third party certifier of businesses owned and operated by women in the US. Analytics Transformation using Self-Service Visual Analytics capabilities of SAP Lumira. Services will also include migration of the existing SAP Customers to the new generation solution from SAP i.e. S/4 HANA which is built on Digital Principals. GapBridge is more than 5 years old with operations spread across Americas, Europe, Middle East and Asia supported through its Global Delivery Centre (GDC) based in IT Capital of India – Bengaluru. Funded by $400 Million SGF Group, GapBridge has demonstrated YoY 100% growth rate since inception. GapBridge recognized by InsightsSuccess Magazine as IsTech50 Most Valuable Tech Companies Globally in Dec 2015 edition and featured in si50 Fastest Growing companies by Silicon India in Dec 2014 edition. European operations will be headed by Mr. Udo Rossner. Udo comes with more than 25 years of industry experience and has served with various IT leaders in management position. GapBridge is already serving more than 100 customers across various regions in variety of engagement models like – Managed Services, Fixed Cost / Scope implementation, Time and Material etc. Mr. Rishi Bansal – Managing Director, GapBridge. GapBridge is a Global Enterprise Consulting and IT Services organization, offering Digital journey to its customers by providing solutions around Mobility, Analytics and Cloud on platforms provided by SAP as well as other enterprise vendors. Our Clients leverage our in-depth industry and technical knowledge to extract maximum value, reduce TCO from their IT investments. Our expertise help clients drive strategic business growth, improve business processes, reduce operational complexities and increase corporate agility. Saatvik Green is one of the upcoming companies in India providing Green Energy solutions. Saatvik manufactures and markets high quality, high efficiency solar photovoltaic modules. Employing among the most advanced and sophisticated technologies available worldwide, a state of the art facility. SAP S/4HANA is SAP’s next generation business suite designed to help customers run simple in a digital and networked world. This new suite is built on our advanced in-memory platform, SAP HANA, and offers a personalized user experience with SAP Fiori. GapBridge will implement S/4 HANA for Saatvik Green to meet following key business challenges. All financial Information at fingertip. To have a system which is simple to run and can support various financial requirements like Cost Management, Profitability and Cost Analysis, Financial Reporting, Closing operations. Logistics requirements like Procurement Analytics, Purchase order processing with multi device support, Make to Order as well as Make to Stock business scenarios, Quality Management, real-time reports on inventory positions, on-time delivery performance and shipping performance. Customer service – improved service productivity, accurate customer install base information, clarity on identification for customer assets for service agreements, creating accurate and reliable budget planning. Value from SAP S/4 HANA. Simple user interface (UI): SAP S/4HANA delivers a role-based, consistent user experience. That experience includes the ability to access and use SAP S/4HANA from any device. Simple business solutions: SAP S/4HANA is built to empower the way that businesses want to work with real time insights and processes across a digitally connected network. Simple data model: SAP S/4HANA enables applications to offer the best level of performance with the lowest data footprint. Re-imagined business models can save costs: With SAP S/4HANA, the Internet of Things (IoT) and big data become accessible to any business. SAP S/4HANA connects people, devices and business networks in real time, which greatly simplifies modern business. Additionally, it helps reduce the data footprint and work associated with larger data sets stored in one system, which saves time and money. Re-imagined business decisions can drive faster impact: SAP S/4HANA makes it simple to gain insight on any data from anywhere in real time, which lets you drive a fast business impact. Plan, execute, predict and simulate on the fly so that you can make important decisions today that will still apply in the future. Get work done faster with re-imagined business processes: Simplify your business processes to gain new efficiencies across your organization. Use SAP S/4HANA to help you focus on the most essential tasks in real time and to adapt quickly. Improve employee engagement with a re-imagined user experience: SAP S/4HANA is natively designed with the most modern, role-based user experience: SAP Fiori. SAP Fiori makes it simple to get the job done across lines of business with a personalized, simple UI available on any device. – by Mr. Pramod Garg, Chairman and Managing Director, Saatvik Green Energy. – said Mr. Rishi Bansal, Managing Director, GapBridge. Digital Transformation – Be Future Ready : How Digital World will look like for manufacturing industry, how they can prepare themselves better for future, how digital adoption can take, how Internet of Things (IoT) will change business dynamics and how to define digital roadmap. Digital Transformation – Go Mobile: Mobility a key component of Digital World, How Enterprise Mobility changing way of doing business as well as evolving new business models, various mobility platforms and right adoption approach, defining the first step and various possible business scenarios to bring on mobile. Special discussion on SAP Mobile roadmap with SAP UI5, SAP Fiori and SAP Mobile Platform. Innovation with Analytics : Rejuvenate your Business Intelligence, How transformation is taking place from tradition BI/ reporting systems to Visual Analytics, building blocks for right Analytics strategy, enabling business users with quicker and better business insights, various visual analytics tools like Qlik, SAP Lumira, Tableau etc. 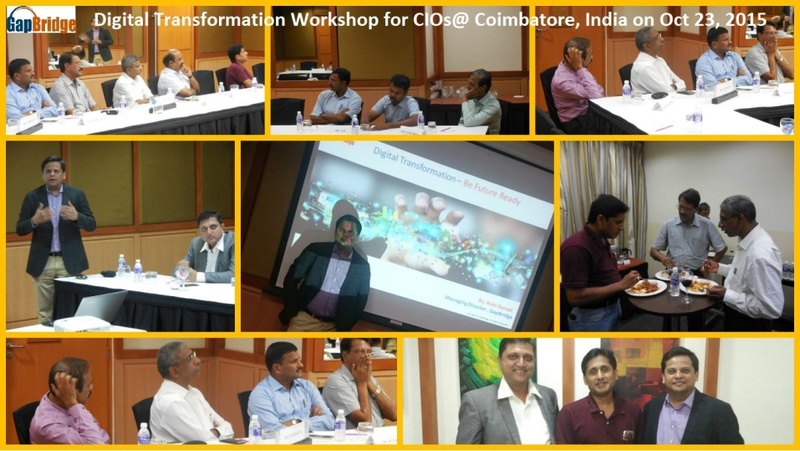 CIOs from various Manufacturing companies in Coimbatore participated in the workshop and learnt how they can get their organizations Digital Ready with – Social, Mobility, Analytics and Cloud. –Mr. Subodh Nair, GM –IT , Elgi Equipments Limited. – By Rishi Bansal – Managing Director, GapBridge Software Services. GapBridge Software Services a leading Business Consulting and IT Services organization with prime focus on Enterprise solutions today announced that it has become part of SAP Extended Business Partner Program to Enable Business Transformation for its customers to make them better prepared for future challenges with solutions around – Cloud, Mobility and Analytics on SAP platform. GapBridge is more than 5 years old with operations spread across Americas, Europe, Middle East and Asia supported through its Global Delivery Center (GDC) based in IT Capital of India – Bengaluru, featured in si50 Fastest Growing companies by Silicon India. GapBridge will work closely with SAP team on Go-To-Market strategy for taking cloud solutions like Ariba to the customers in India. To offer good value to the customers GapBridge has established team of sourcing experts to advice customers on various sourcing methodologies and effective use of solutions like Ariba. GapBridge has established a dedicated competence around SAP Fiori , UI5 and SAP Mobile Platform to offer customers better utilization of the solutions implemented over cloud as well as on Premise. Go Mobile strategy is also important to create Mobile Work Force which is need for future – Be in Business anytime, anywhere. SAP Fiori being the future UI for various SAP products like SAP ECC, S4/HANA, Ariba , SuccessFactors etc. GapBridge is putting investments to build standard out-of the-box Fiori Apps for giving single user interface to multiple SAP solutions. GapBridge has established dedicated team to take Analytics to the customer. Team working closely with SAP teams on SAP Lumira to offer visual analytics to the customers. Powered by SAP ECC, SAP BO/BI or SAP HANA – SAP Lumira offers users a tool to build quick insights on business.